Tiny SINGLE (1.5cm. Light pink. Densely foliated rounded little plant of ultra slow growth. Flowering early July to mid-September. Miniature INFORMAL DOUBLE (4cm). White. Flowers borne in profusion along the branches. Medium growth. Flowering early June to mid-September. Small, SINGLE bright yellow. Vigorous, upright growth. Shy to flower at young age. July to September. Small, SINGLE bright yellow. Vigorous, upright growth. Shy to flower at young age. Flowering July to September. Dainty, INFORMAL DOUBLE. Silvery pink flowers borne profusely along pendulous branches of grey-green foliage. Bushy fast growth. Flowering early May to mid-September. Petite, SINGLE white flower borne in profusion in profusion along branches. Medium, upright bushy growth. Flowering early autumn and late winter. Can withstand morning sun in winter. Small INFORMAL DOUBLE. Pale pink shading to blush pink. Medium, bushy growth. Flowering May to September. Small SINGLE (6cm). Flowers red, trimmed with a bold white border. Upright, fast growth with slender pendulous branches. Flowering mid-March to endof June. 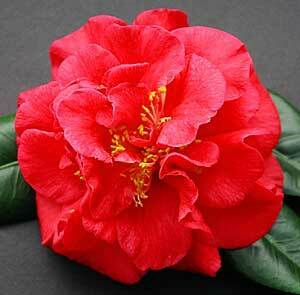 Small blooms of 4.5cm diameter have a single row of red outer petals and white petaloid centre. Fine, sasanqua-like foliage. Medium upright and rather open growth. Flowering mid-April to early September. Miniature SINGLE, white mass flowering. Small, cerated, dark green foliage. Medium growth with arching, fern like branches. Flowering early June to September. Miniature SINGLE, white marked with pink edging. Early flowering. Fast upright growth, dark green foliage.